A couple of years ago when my husband and I took a Christmas trip to Portland, Oregon, we knew that one of the places we needed to dine was Pok Pok Portland. After having heard so much about how amazing and authentic the Thai food was at Pok Pok, when we returned to Los Angeles, I knew I had to take my dad to dine at the new Pok Pok LA. 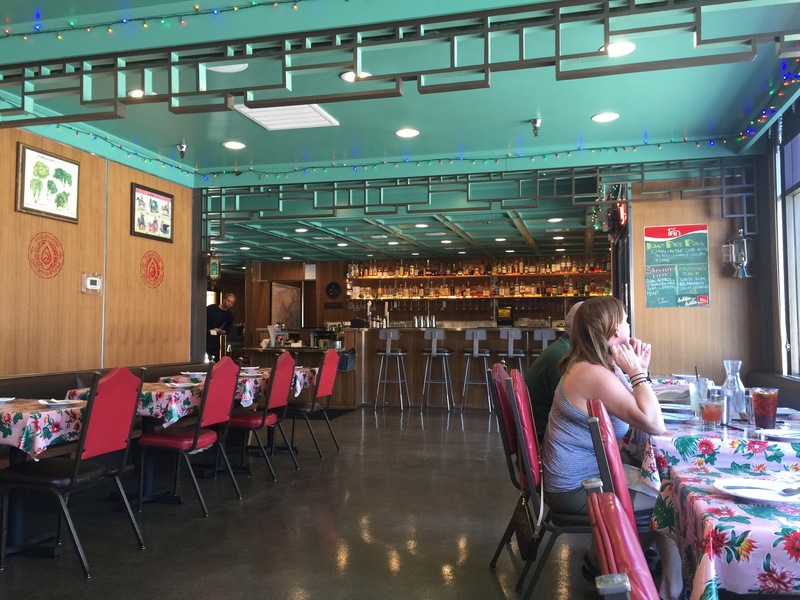 This is the kind of food and atmosphere that is right up his alley and something he would appreciate, so we made plans one weekend for lunch to meet my parents down in Chinatown where Pok Pok LA opened up shop. Opened just over a year ago, Pok Pok LA is famed James Beard award-winning chef Andy Ricker’s foray into the Los Angeles market. 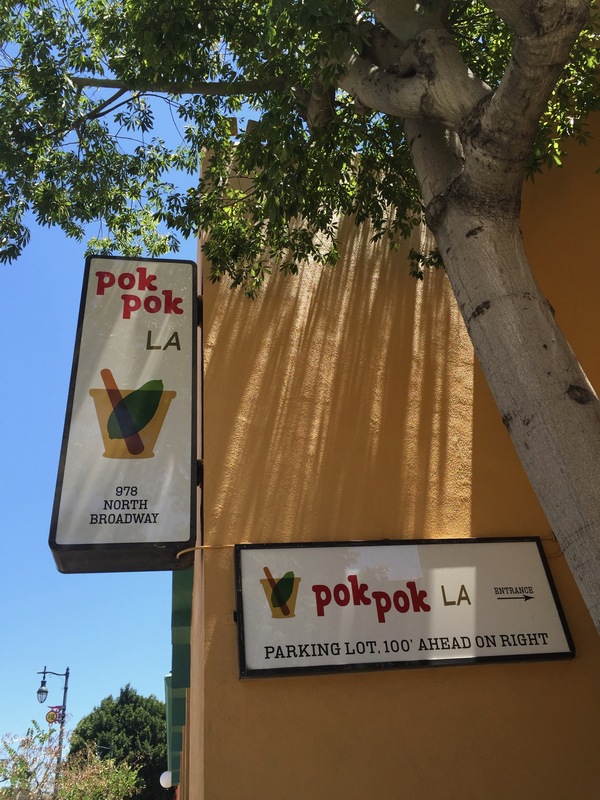 The Pok Pok brand that has made him famous in Portland and New York now has its own spot in Los Angeles’ historic Chinatown neighborhood away from the competition of all the other Thai restaurants in Los Angeles’ Thai Town neighborhood. Only serving lunch on the weekends means that the menu is a little bit more limited than the evening menu, which was a bit of a disappointment. I would have loved to have taken my parents to dine here when we had the option of the full complement of menu items and a more lively, more happening atmosphere. Pok Pok LA’s design pays homage to a little bit of Chinese and Thai heritage. Some of the architecture and look and feel of the interior is Chinese, but the seating and the table cloths are reminiscent of Pok Pok Portland and certain all Thai style. The restaurant features ample seating in an open area and a full bar at one end of the dining room. Everyone has their little quirks and sometimes none of us like change, that’s why when we dined at Pok Pok LA, my husband and I ordered the same exact drinks that we did when we dined at Pok Pok Portland. My husband ordered the naam manao, which literally translates to lemon water in English. In actuality, it’s fresh squeezed limeade made Thai-style so that it’s fizzy, sour and sweet. 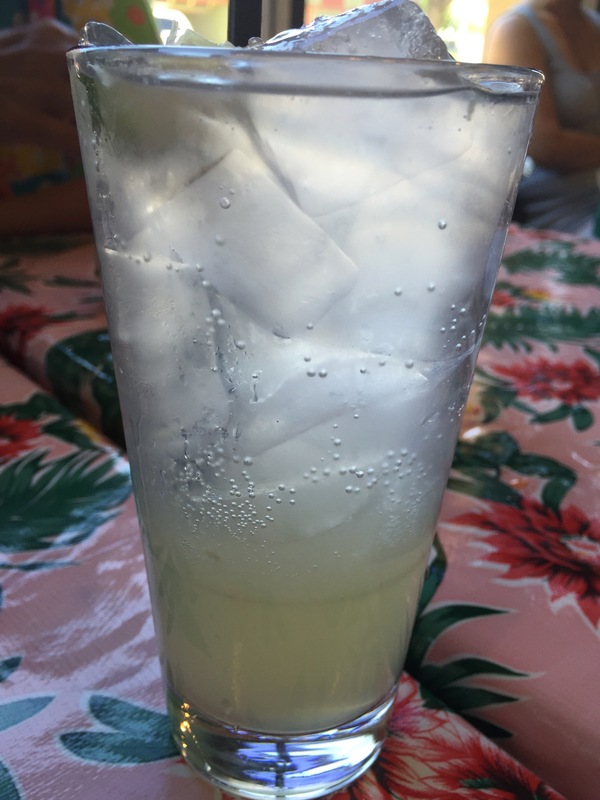 My husband has always been a lemon, lime acidic citrus fan, so this drink was right up his alley, a homemade limeade with just a bit of fizz and carbonation. For me, I can’t go to a Thai restaurant without ordering a classic Thai iced coffee. At Pok Pok, I ordered the kafae boraan yen, which literally translates to old school cold coffee. This is iced coffee made the ancient Thai way where coffee, in this case Stumptown coffee, is brewed in a sock and then combined with condensed milk and sugar. 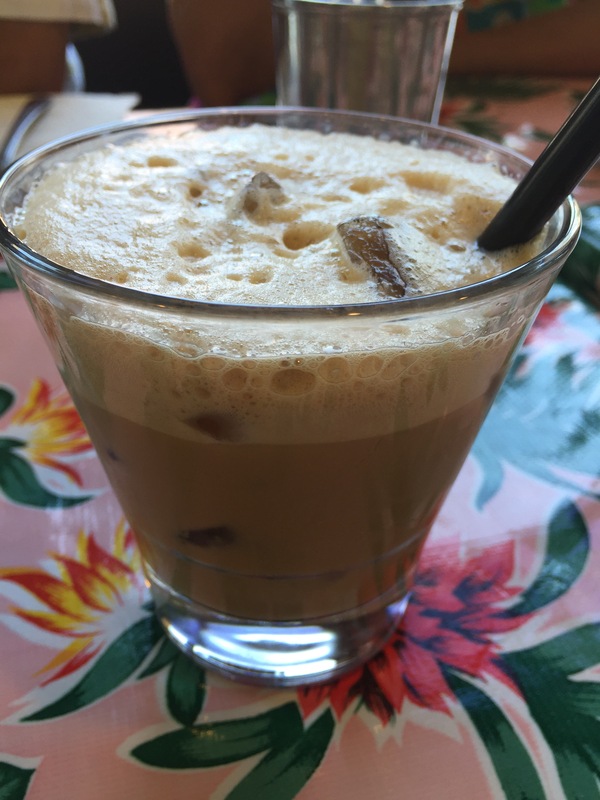 The iced coffee is rich, and slightly thicker from the condensed milk and sweet from the sugar. But most of all, it’s strong from the brewing technique and you really get the real coffee taste that shines through, and I love it. To start, we had to order the Ike’s Vietnamese fish sauce wings to share at the table. My husband and I loved them in Portland and they are one of Pok Pok’s signature dishes. I wanted my parents to give it a try and experience the flavors for themselves. 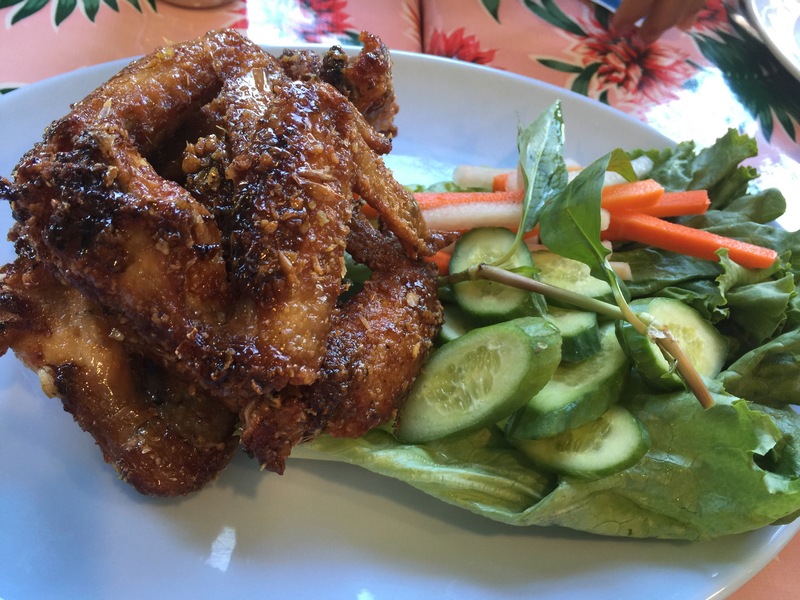 Half a dozed whole natural chicken wings are marinated in fish sauce and sugar and then deep fried and tossed in caramelized Phu Quoc fish sauce and garlic and served with a side of Vietnamese table salad. The result is slightly sweet, slightly salty, crispy and sticky Vietnamese-style chicken wings. Using Phu Quoc fish sauce is interesting as that’s the preferred fish sauce used in Thai cooking as well, or at least that’s what my parents tell me as that’s the brand of fish sauce we use at home as well. It creates a somewhat sweet, somewhat salty flavor that isn’t overpowering and certainly doesn’t have a fishy smell like its name would infer. The chicken wings are fried to perfection with the outside skin nice and crispy, while the inside meat was tender and juicy and delicious. The flavor of the sticky fish sauce and garlic mixture just gives the chicken wings a different and unexpected taste that’s just really delicious. For entrees, we decided to order three different dishes to share family style between each other. The first dish was neau naam tok, or literally translated to beef waterfall. 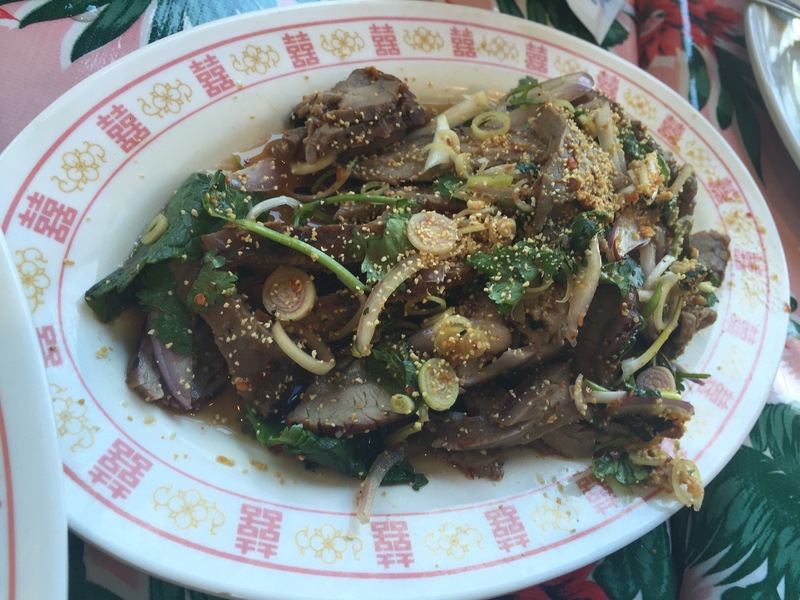 The menu describes the dish as a spicy Isaan charcoal grilled flank steak “salad” with fish sauce, lime and chili powder dressing, shallots, lemongrass, mint, cilantro and toasted rice powder. I liked that this dish was flavorful and yet not too spicy. One signature of Northern Thai cuisine, which is what Pok Pok focuses on is the fact that it ratchets up the heat level, and since I’m not a lover of spicy food, it sometimes makes it tricky for me to find something on a menu that I can actually enjoy. With this steak salad, because they used chili powder as opposed to actual Thai chilies there was some level of heat, but it wasn’t overwhelmingly spicy. The steak was tender and flavorful, combine that with the fish sauce, lime, shallots, lemongrass, mint and cilantro as a “dressing” for the salad, and you have your combination of sweet, spicy and sour, the signature of any good Thai dish. The toasted rice powder added a bit of crunch and texture as did the thin-sliced shallots. While this dish is billed as a steak “salad” it is definitely more steak and very little salad other than the fact that the “dressing” is a sauce for the steak to soak up. This is one dish I would definitely order again. We wanted a dish that was a little lighter to balance out the beef-heavy dish we just ordered, so we went with a dish called yum khai dao and added ground pork and prawns. 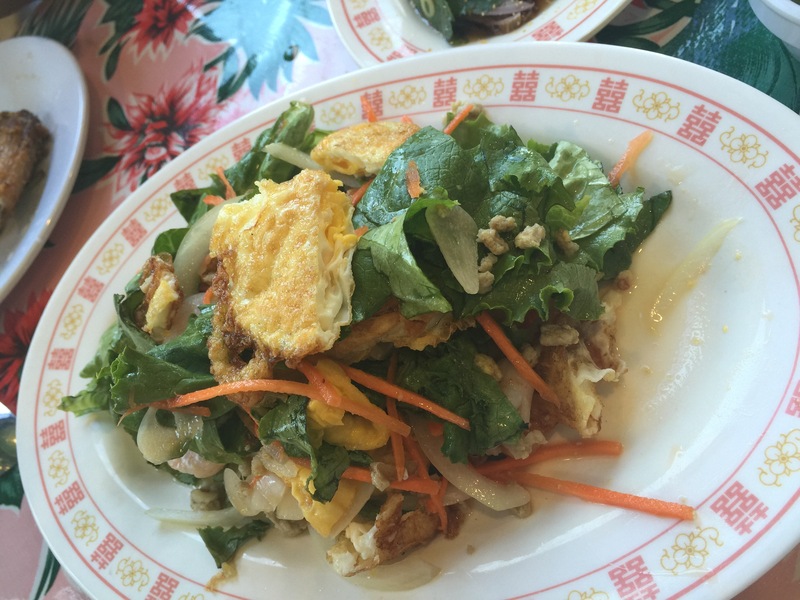 Yum khai dao means a stir fry of sunny side up eggs or as the menu describes it a crispy fried farm egg salad with lettuce, Chinese celery, carrots, onion, garlic, Thai chilies and cilantro with a lime, fish sauce and palm sugar dressing. Of our three dishes, this one was my favorite. The Thai chilies added heat to the dish, and they were chopped up kind of fine, so I needed to be careful to pick around them and not to actually ingest one. The crispy fried egg really made the entire dish, it added body and texture to the dish and the palm sugar dressing was amazing. The sweetness of the palm sugar balanced out the tang of the lime and fish sauce perfectly. The “salad” itself was quite refreshing. This was actually the last dish we had agreed upon, and I’m glad we got it. Now, I just need to figure out how to make this palm sugar dressing at home myself and I’d be setting. Add some egg, lettuce, shallots for a bit of bite, julienned carrots for texture and ground pork for a bit of protein as well as some sweetness and you’re all set. Finally, we all agreed on ordering the kung op wun sen. Wun sen is the Thai word for cellophane or glass noodles, and kung op means baked shrimp. This is a popular Thai dish, especially in cities where fresh seafood is abundant. 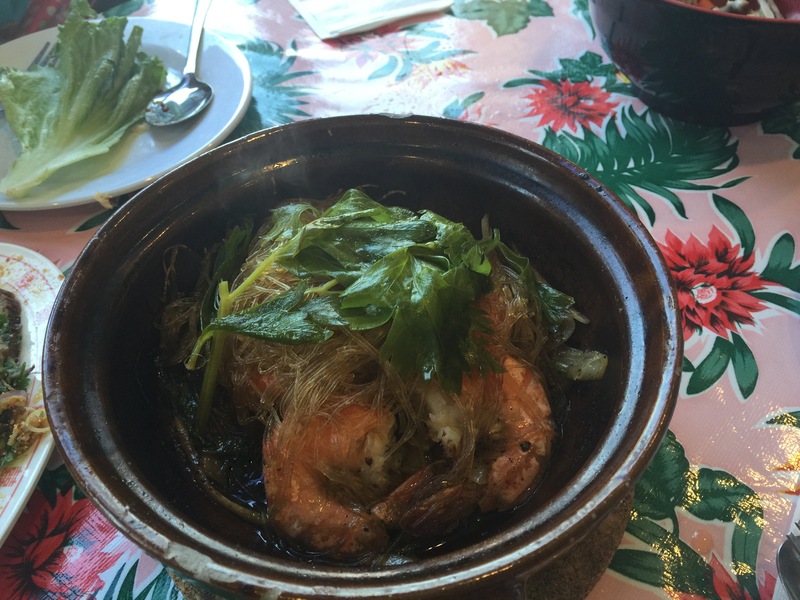 The large prawns are baked in a traditional clay pot heated over charcoal. The prawns are combined with pork belly, lao jiin, soy, ginger, cilantro root, black pepper, Chinese celery and bean thread noodles. The dish is then served with naam jiim (sauce) seafood to dip the prawns in. The entire clay pot is then served straight from the charcoal flame right to the table. The size of the prawns in the pot were impressive, and Pok Pok sure didn’t skimp on the amount of prawns they provided. This was probably the least spicy dish we ordered as the only source of heat in the dish was from the black pepper. But boy was there lots of black pepper, but I lack the flavor of black pepper, so that worked for me. The flavor of the baked prawns was amazing, there was some sweetness from the soy and the ginger, and a little bite from the black pepper, but the prawns were sweet and juicy and delicious. My mom appreciated the seafood sauce provided as it provided the heat and the bite she was looking for. The glass noodles were a perfect accompaniment as they had soaked up all of the flavors of the pork belly and the prawns as well as the sauce that baked the prawns in the pot. Therefore the noodles were soaked in all these flavors, and yet the noodles were limp and tender and absolutely perfect. With only 3 dishes and an appetizer to share between the 4 of us, we still couldn’t quite finish all the food. No worries, left overs keep very well and are just as tasty when heated up the next day. After years of watching Andy Ricker on TV and hearing of our adventures at Pok Pok Portland, my parents finally got to experience the genius behind Andy Ricker for themselves when my husband and I took them to Pok Pok LA. I knew that of the two of them, my mom would be a tough customer. First off, she’s old school and for her, good, authentic Thai food comes from a Thai person with recipes handed down for generations. Seeing that Andy Ricker is a self-taught chef who traveled to Thailand as a youngster and fell in love and stayed for a period of time while he learned the food and the traditions and brought them back to the United States was not enough to convince her that Pok Pok LA was a homerun. While there were certain dishes that she liked and flavors that she could appreciate, she was still a tough sell. My dad on the other hand thought that the hype lived up to the billing, the restaurant and the food was, in ways, more authentic than some restaurants that you find in Thai Town and for someone who isn’t Thai to bring this level and quality of authentic Thai dishes to the masses was impressive. I guess you can’t win them all and sometimes change just takes some getting used to, much as Andy Ricker himself has alluded to in an interview he did with Eater LA last month where he discusses the struggles that some of his restaurant concepts have run into in Portland, New York and Los Angeles.